Warner Bros. announced a season pass for Batman: Arkham Origins today. It will be available at launch on October 25th for $19.99 and include five of the game’s upcoming downloadable content packs, one of which includes two exclusive skins. The coolest part of the upcoming DLC in my opinion is the “Arkham Origins Initiation” mode. Here, you’ll be able to play as Bruce Wayne before he became Batman, and face his final test to prove himself worthy to his greatest teacher, Kirigi. An “all-new story campaign” is also included, though there’s no details about that at this time. Check out the full press release below for more information and click here for a full-resolution version of the DLC ad. Warner Bros. Interactive Entertainment today announced the Season Pass for Batman™: Arkham Origins, this fall’s highly-anticipated installment to the best-selling Batman Arkham videogame franchise. 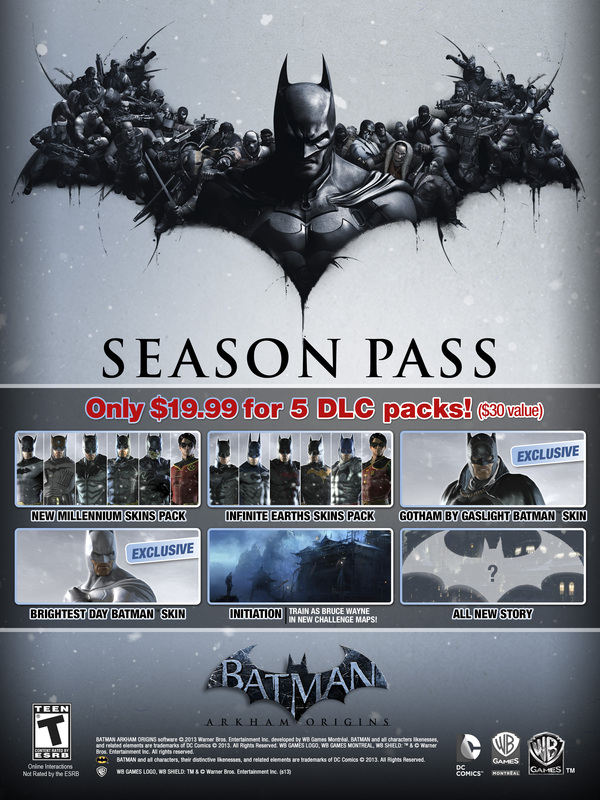 The Batman: Arkham Origins Season Pass (for PlayStation®3 system, Xbox 360® video game and entertainment system from Microsoft, Wii U™ system or PC) will be available at launch for $19.99 ($30 value) and grants purchasers access to five of the game’s upcoming downloadable content packs, one of which includes two exclusive skins.